We recognize our responsibility—as employees, as a company, and as global citizens—to minimize our environmental footprint. 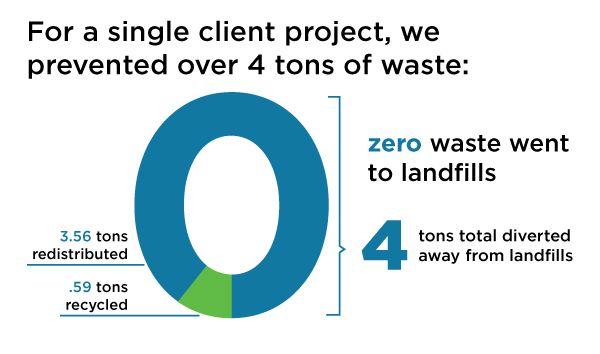 We have been diligent in seeking product and process solutions for our clients that provide opportunities to reduce waste, use energy more efficiently, and operate more sustainably. Whether you have just begun to explore ways to protect the environment through green product choices, or are pursuing LEED certification for your facility, we will bring the necessary product portfolio and experience to bear. Working with you and your design team, we can help you achieve your green goals. Steelcase, Atmosphere Commercial Interiors’ major manufacturer partner, helps clients seeking LEED certification identify products and programs that can contribute to LEED criteria in the categories of Materials and Resources, Indoor Environmental Quality, and Innovation (Ergonomics Training, Sustainability Training, and Product Innovation). Our furniture disposal program is environmentally friendly and can support sustainable practices, including LEED and B3 requirements. Our experience, and relationships with local environmental organizations, allow us to offer unique disposal solutions to avoid landfill including brokerage, charitable donations, liquidation and recycling. Our recycling service program has been in place for over 25 years. Whenever possible, we request that product ship direct to the project site and be blanket wrapped to minimize the about of cardboard used. Product that is shipped to our warehouses is unpacked as much as possible. All packaging and trash is removed from project sites daily and returned to the warehouses for proper recycling and disposition. Items that come palletized are un-crated and the pallets are recycled. Our decommissioning services of taking apart furnishings and breaking them into their core materials for proper recycling are at the core of our program (for example, products are removed from site and properly recycled instead of going to a landfill). Through this process, we recycled over 5 million lbs. of steel in 2016, and are on pace to exceed that quantity by the end of 2017. Both Atmosphere and our service team are the proud recipient of IFMA’s Green Initiative Award. We continuously seek green business practices that when added up, make a meaningful impact. Reduce waste by employing paperless practices in all departments. Reduce our carbon footprint by avoiding travel, due to high quality video-conferencing capabilities in all offices. Supply all team members with remote technology, to allow work to happen wherever it needs to, including on a client’s site, at home, or while traveling. This strategy increases the opportunities to work smartly and efficiently. Encourage mass transit use and offer discounts where applicable. Use LED lighting throughout our facilities. Incorporate plants where possible to help improve air quality. Reuse existing furniture during facility renovations. Equip our café spaces with reusable dishes and supplies. Equip our facilities with waste and recycling receptacles.